Born in the 1980s, turning 30 has its advantages, you begin to know who you are and what you want - you feel like you can finally grow up and get on with life. Celebrate this milestone with friends and keep your drink cold with a personalised stubby holder from Coolaz! We can change the '30th' year to any year you like! Simply, elegant script with a bold watermark in teh background for this birthday stubby holder template design. 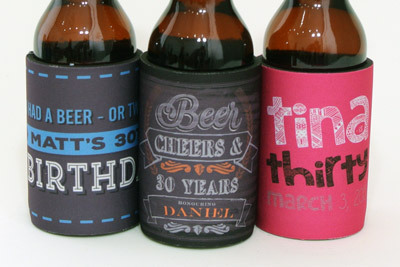 Punchy stubby holder design that is suitable for pretty much any 30th birthday get together. Feminine stubby holder design for the 30th birthday girl. Another simple stubby holder design with hints of the 20s and 30s. Can be altered to be more masculine if preferred. We've a grey and black version of this stubby holder design already on file if you would like change this template to suit a male's birthday. Neon was all the rage back in the 80s - this stubby holder design pays tribute to those wild days! Wonderful hand-drawn feeling to this stubby holder design which will work for pretty much any birthday occasion. For the sophisticated birthday boy or girl, this stubby holder design is extremely flexible in terms of design - change colours, add a photo - its up to you. Arial Rounded is a fun font, but not too wild. This stubby holder uses it to great effect - change colours and text to suit your occasion! Using a font that is familiar with US colleges, this birthday stubby holder design has a varsity feel while remaining quite formal at the same time. A James Bond homage with this design - change any of the text to whatever suits when you place your order. A celebratory stubby holder for the 30 year old Eagles fan - we've all the other teams on file so let us know the age and team and we'll put your design together for you! Of course, you don't have to supply an image for this stubby holder design - the text looks great on its own too. Detailed illustrated stubby holder design - a great vintage look for your 30th birthday mementos. Slight alteration of the fantastic Back to the Future logo for this stubby holder design showing the time of birth and the time of the party! Let us know all the relevant information for your birthday boy or girl when you order! You can Rock out in style with this as it's sn awesome design for a Metal or Rock and Roll fan.